The American Missionaries in the Ottoman Empire before, during and after the Turkish Genocide against the Armenians: Towards a detailed accounting of ‘who was where and when.’ A list prepared for Ambassador Henry Morgenthau by William Wheelock Peet, Bible House, Constantinople dated 7 October 1914. Many descendants of survivors of the genocide against the Armenians by the Turks often find themselves searching for bits and pieces of information, which have relevance for family histories preserved at various levels of completeness and detail. For example, sometimes a name of a missionary or a relief or orphanage worker has been passed down but the precise form or pronunciation is not quite accurate, especially when transliterated from Armenian. Or, precise time frame and sequences may be only provided in a general or slightly inexact form etc. How nice it would be for descendants to be able to start putting some things into a more precise context by consulting a modern database to obtain facts that may be used for comparison or verification. We received some positive responses to our posting “NINETY-SIX YEARS AGO TODAY. The S.S. Leviathan leaves Hoboken, New Jersey on Sunday, February 16th 1919 with nearly 250 early responder volunteers of the American Committee for Relief in the Near East anxious and determined to help in ‘reconstruction.’” (see Groong 16 February 2015 - http://www.groong.org/orig/ak-20150216.html). 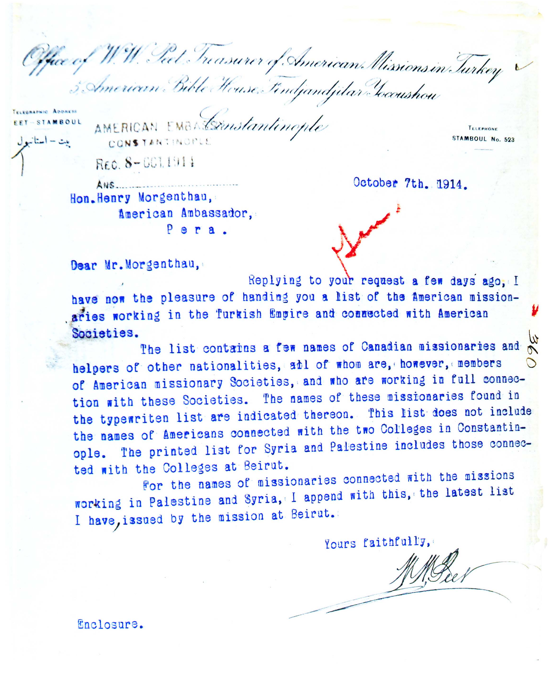 Those responses prompted us to wonder whether it might be useful to provide a document dealing with missionaries, mostly Americans but others as well who were in service in the Ottoman Empire in October 1914. Even though the list is only a beginning of what one can envision as a final product, we hope individuals so inclined might take this up as a very worthwhile project and keep it going and adding to it. This centenary of the onset of the Armenian Genocide makes it ever more clear that the torches must be passed on. The personal face of the genocide is fast becoming faded or even lost. 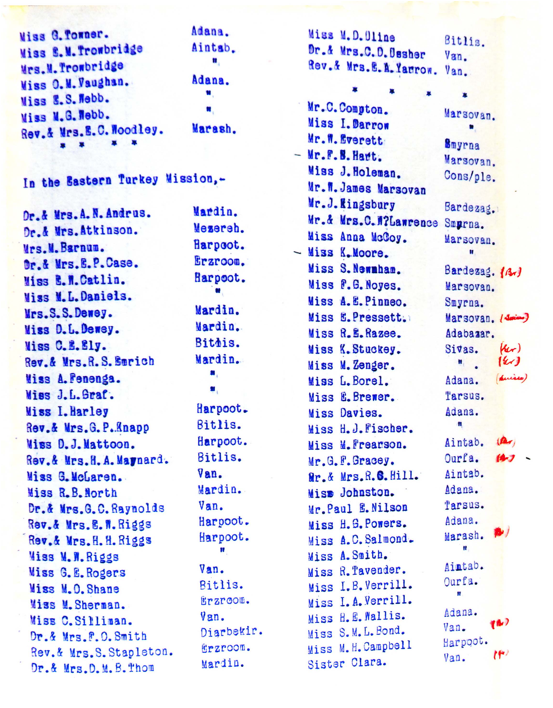 Without doubt, the information to carry out this task is available and one indeed can generate a compact yet comprehensive data base on the various missionaries serving in Turkey, their backgrounds, their postings, relevant writings, their photographic legacies, their eye-witness and hearsay accounts and experiences, date and place of death, burial etc. There are, of course, many convincing arguments that can be made urging comprehensive assemblage of this material according to the regions and places where and when the missionaries served, as well as relevant cross-referencing alphabetically by surname, even by first name etc. Pulling such information together in a single place is long overdue. While it might take time to accomplish, there is no telling how much time it could save in the long run. 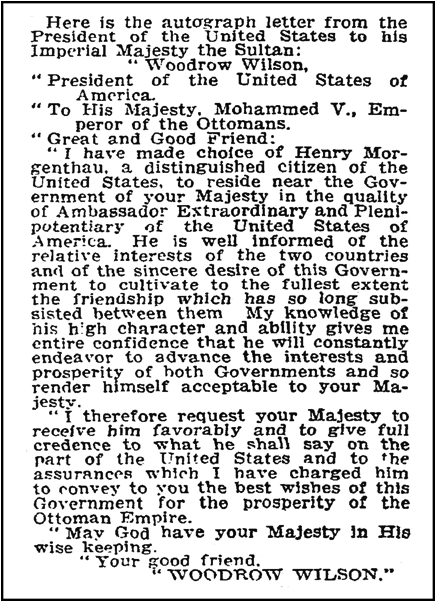 The name of Henry Morgenthau, praised by many for his qualities “as a New Yorker, as an American, as a philanthropist, and as a financier and lawyer” was put forward by President Thomas Woodrow Wilson (1856-1924) for the post of Ambassador to the Ottoman Empire in August 1913 to succeed William Woodville Rockhill (1854-1914) who had left Constantinople after a farewell audience on November 20, 1913 with Sultan Mehmed Rashid V. The U.S. Senate approved Mr. Morgenthau’s nomination on September 4. He was given an elaborate sendoff at the luxurious Astor Hotel in New York City. One can read about it in The New York Times, October 31, 1913 pg.7. A key point is that there was sufficient concern and good sense to have an accounting of the missionaries in the Empire and therefore should be viewed and treated as American charges of the Ambassador. The cover letter from Mr. Peet indicates that the Ambassador asked for it. Certainly things were brewing and the clouds of war were gathering. William Wheelock Peet (1851-1942) was the Treasurer of the American Board of Commissioners for Foreign Missions in Constantinople and had an enormous amount of expertise and experience navigating the system and dealing with Turkish bureaucracy. He and his wife had been in Turkey since autumn 1881. The following four pages derive from photographs taken by us at The United States National ‘Archives II’ in College Park, Maryland. The annotations in red are not the clearest but one can figure out other nationals - Br indicates British [mostly Canadian], Dane - Danish, Gr - German, and Swiss etc. We cannot say who made the annotations. Readers will recall that we are very much interested in locating and identifying good quality photographs of any and all sorts, including those of people associated with situations deemed especially noteworthy in and of themselves, or of relevance to the persecutions and massacres culminating in the Genocide. We present below a group photograph that includes Ambassador Morgenthau and Mr. Peet. This photo dates from January 1915 and is so marked on the back in pencil. We thank the Franklin D. Roosevelt Library and Museum, Hyde Park, New York for their courtesy in allowing the group photograph to be scanned on site. When it was first published in 1915 it was tersely described as “STAFF OF AMERICAN RED CROSS HOSPITAL, TAXIM.” The caption goes on to say, “Front row left, to right: Dr. W.M. Post; the Mother-Superior; Hon. Henry Morgenthau; Mrs. Morgenthau; Hon. G. Bie Ravndal, Mr. W.W. Peet” (cf. The Orient issue of February 17, 1915 volume 6 no. 7, pg. 50.) In a considerably later date publication (1918) we see same photograph with the caption “At the American Red Cross. Mr. and Mrs. Morgenthau (in the centre of the group) devoted much time to this establishment. Dr. [Wilfred M.] Post [1876-1966], an American, (extreme left of the first row) was the medical head. Next to him is Sister Jeanne [Soeur Jeanne, who served as head, Mother Superior, of the French Hospital in Constantinople]. 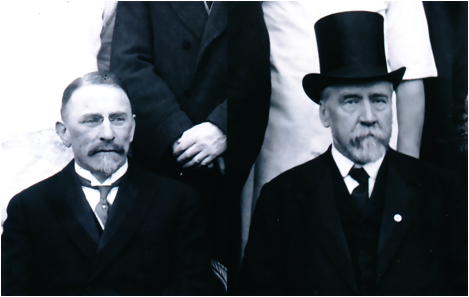 At the right of the first row is Mr. [Gabriel Bie] Ravndal [1865-1949] American Consul General at Constantinople, and Dr. Peet, secretary of the American missionary interests” (see Henry Morgenthau “Ambassador Morgenthau’s Story” in The World’s Work vol. 36, no. 3 July (1918) pg. 270). An interesting aside on this photograph is that the people in it seem not to be dressed for very cold weather. Only a few men are wearing topcoats. Were it not for the dating on the rear and the February 1915 publication in The Orient one might have estimated the photograph from around late autumn of 1914. Photograph Taken in January 1915 at the American Red Cross Hospital at Taxim. We also present two blowups from the group photograph. Here Ambassador Morgenthau and Mr. Peet are juxtaposed on the same scale. The intent here is to allow comparison of the two men in terms of size and physique. Again, courtesy of the Franklin D. Roosevelt Library and Museum, Hyde Park, New York. 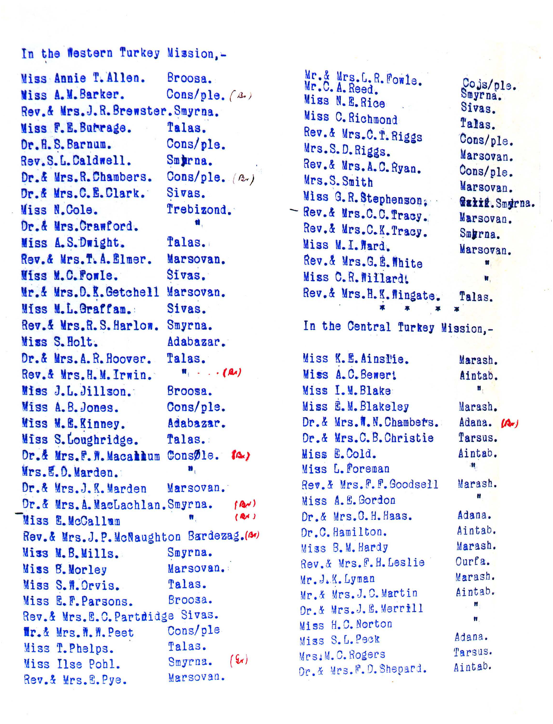 WHAT COULD BE SAID ABOUT THE MISSIONARIES IN NOVEMBER 1915? “Five Missionaries Succumb to the Shock of Armenian Horrors, Says Report. “The strain and shock of the tragedies that the war has brought to Turkey during the last year is responsible for the deaths of five of the American missionaries on duty in the Turkish Empire since the first of last May, the period covered by the Turkish campaign against the Armenians, according to the annual report of the Rev. Dr. James L. Barton, the foreign secretary of the Board of Commissioners of Foreign Missions, made public here yesterday. “The missionaries whose deaths are attributed to the terrible conditions in Turkey were Mrs. Mary E Barnum, died at Harpoot, May 9, after fifty six years of service in Turkey; Mrs. Charlotte E. Ely, died at Bitlis, July 11, after forty-seven years’ continuous service; the Rev. George P. Knapp, died at Diarbekir, Aug. 10, after twenty-five years’ service at Harpoot and at Bitlis; Mrs. Martha W. Raynolds, wife of the Rev. Dr. George C. Raynolds, died Aug. 27, from injuries received while in flight from Van to Tiflis, Russia, and Mrs. Elizabeth Ussher, died of typhus fever at Van, July 14, after sixteen years of service. “Referring to the treatment of Americans by the Turkish authorities, Dr. Barton says that when Harpoot was made a military centre several of the buildings of Euphrates College were voluntarily turned over to the Turkish military authorities. A large dormitory was not and the American Consul sealed the door with the official seal of the United States. And so it went, on and on…. No more needs to be said at this point. Good fortune will hopefully help the task set before us to develop and expand a worthy data base. A trivial spelling error involves the well-known Danish missionary nurse Miss Maria Jacobsen. Her surname is misspelled - son. We make an attempt to provide here a few readily available sources that may be consulted online as a starting point for those new to such research. The long and short of it is that it is not difficult but requires some dedication and attention to detail. An excellent source of information on American Board missionaries may be found in the volumes referred to as the “Vinton Books” at the Congregational Library, Boston. These provide a wealth of information - see http://www.congregationallibrary.org/books/vinton. Our early studies when they were not online required using hard copy. 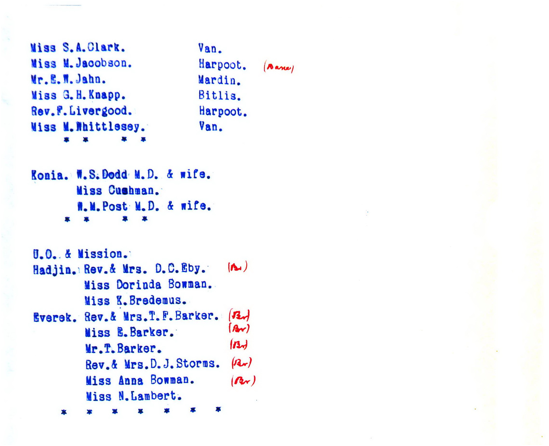 Likewise, the American Board Memorial Book and Personnel Card File at the ABCFM Istanbul, under the auspices of the Digital Library for International Research, allows search by surname - see http://dlir.org/abpcc-home.html. Also provided by the Digital Library for International Research and which is a fairly difficult to find nowadays in its entirety is a publication by Bible House called “The Orient.” Issues are accessible at http://www.dlir.org/arit-periodical-collection/201.html. A particularly helpful aspect of the reportage is the news of the comings and goings of the missionaries to and from the Empire. It was suspended at the end of 1915 and resumed publication in 1919. Its final publication was 1922.The Orient included biographies of early missionaries and drew attention to official Turkish government happenings. Journals like the Missionary Herald (American Board of Commissioners for Foreign Missions, Boston: Published for the Board by Samuel T. Armstrong, 1821-1934) may be accessed on line as well through the Hathi Trust. Although private individuals and those at non-member libraries have to endure a little bit of inconvenience looking at these page by page, it is considerably easier than having to go to a library where they would be consulted in print copy. http://catalog.hathitrust.org/Record/005909183 Google Books has scanned some volumes and these are available at no cost as well. Some, like ourselves who are no means admirers of Woodrow Wilson, might go so far as to describe the letter as one from one imbecile to another. Many contemporary evaluations of Sultan Mehmed V frequently describe him as a harmless imbecile. Imbecile “yes”, harmless “no”. In the context of diplomatic vocabulary nowadays, this letter certainly appears unnecessarily flowery and servile, pretending not only great friendship between the two nations but even intimate personal friendship. Whether this was solely for public consumption in America or an attempt at bolstering Morgenthau’s credibility in Constantinople or both cannot be dealt with here. From United States National Archives College Park, Maryland ‘National Archives II’ RG84, Stack Area 350, Row 10, compartment 9 shelf 4 vol. 354-373.) Digital scanning of materials in bound volumes is not allowed but may, with permission depending on conditions of desired pages in question, be photographed. Ambassador Morgenthau refers to him either as Dr. Peet or Peet in his diaries. We suppose this derives from his thinking that like many of the distinguished missionary men, who had doctor’s degrees in theology etc. so did W.W. Peet (see United States Diplomacy on the Bosphorus: the Diaries of Ambassador Morgenthau 1913-1916, compiled and with an introduction by Ara Sarafian (2004, Gomidas Institute, Princeton and London). Ambassador Morgenthau himself was bestowed the honorary LL.D. from Constantinople College late 1915. The back of the photographed is marked in pencil January 1915 and this fits in with what we know about the photograph. The Pennsylvania Medical Journal volume 181 (January, 1915) p. 310 provides the notice under the heading “General News Items” – more specifically - “Red Cross Works in Turkey. British and French Hospitals in Constantinople are now being managed by the American Red Cross Chapter in the Turkish capital.” It is of significance that as part of a “standalone” photograph in The New York Times, Sunday November 28, 1915 pg. RP2 there is a photograph of Mrs. Morgenthau in the uniform of “a Red Cross Nurse in a Constantinople War Hospital. 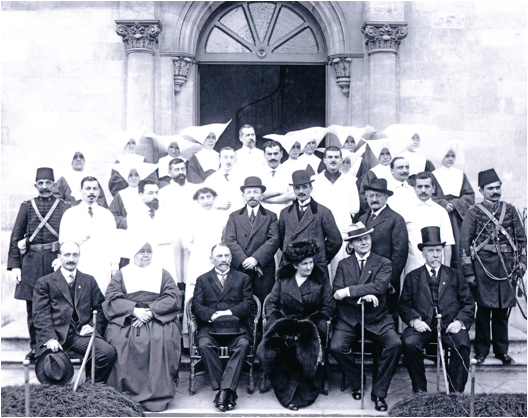 With her is the Mother Superior in charge of the hospital.” This photo was presumably fostered by Mrs. Morgenthau’s return to the United States on 14 October 1915 (The New York Times October 15, 1915 pg.4 entitled “Mrs. Morgenthau home from Turkey.” The ‘standalone photograph’ is identical to the one published in 1918 in The World’s Work July, 1918 pg. 270. In Morgenthau’s Diaries (ed. by Sarafian, 2004 pg. 253) a comment is made under the entry on Monday June 14, 1915 that agreement was reached that “Tash Kishla and the French [hospitals] be run as one, and that we could exchange officers etc.” Refer to the issue of The Orient February 17, 1915 volume 6 no. 7 for photograph of the Tash Kishla Hospital. It was located near the famous landmark of today’s Istanbul the Galata Tower built by the Genoese in 1348 and reconstructed in very recent times.